Wind energy is referred to the mechanical or electrical energy that can be generated by utilizing the wind flow. Wind flows are mainly generated through the earth rotation, uneven heating of earth surface and the irregularities of earth surface itself. 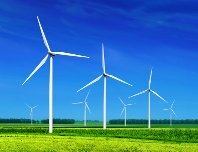 There are various wind energy technologies that can convert wind into a useful form of energy, such as wind turbine that produces electrical power, wind mill that creates mechanical power, wind pump that pumps water using wind power and sail that uses wind direction to glide a ship or boat. Most technologies can be used as a standalone application. But sometimes they can be combined as well, for example to scale up the energy production in a wind turbine farm. Wind turbine, a kind of rotary devices converts the wind into electricity. First it converts the kinetic energy of the wind into mechanical power. Then a built in generator inside the wind turbine convert that mechanical energy into electricity. There are mainly two types of wind turbine based on their rotating direction: horizontal axis wind turbines and vertical axis wind turbines. There are other unconventional wind turbines as well such as floating wind turbine or airborne wind turbine. Horizontal axis type wind turbines are most common in use. They have blades like air plane propeller. The size of the wind turbine varies widely and usually depends on their capacity. Small turbines that are expected to power a single home or business usually has a capacity less than 100 kilowatts. On the other hands commercially used large scale wind turbines may have a capacity of 5 megawatts. When a utility scale source of energy is required, multiple numbers of wind turbines are built closely and a wind farm is formed. A large wind farm may consist of hundreds of wind turbines. Wind farm are connected to the electrical power transmission network. Wind energy is a clean, no-emission renewable source of energy. Wind turbine produces electricity and contributes in reducing air pollution, green house gas emission and water usage of Fossil fuel utilizing power plants. The foot print of a wind turbine is also relatively small considering the amount of power it can produce. When wind turbines are located offshore they even have smaller impacts than turbines located on the lands. Wind power generation is completely depended on wind flow. So when wind is not flowing or wind flow is reduced, it impacts the power generation. That is why most of the time wind power is used as a supplement in the electrical power grid. There are some other drawbacks of wind turbines as well although they are not that significant comparing the benefits. Some do not the like view of a large machine near their landscape and some do not like the noise made by the rotating blade of the wind turbine. Some wind turbine causes death of birds and bats as well.